The great thing about this you can change up the vegetables you use to suit what you have available, what’s in season or simply the root vegetables you like best. Just use similar quantities. Same with the beans, use a tin of the ones which you prefer. 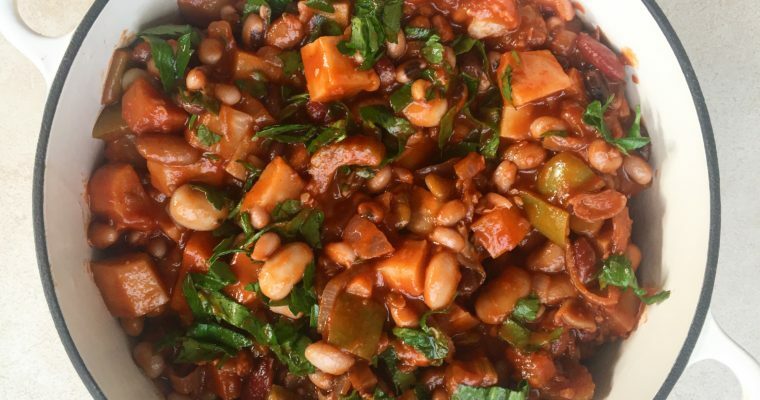 I love butterbeans and kidney beans in this stew but you can use any. Just make sure you add them at the end, before popping the stew in the oven, as they are already cooked so any sooner and they will break up and go mushy. You can cook the whole dish in one pot if you have an ovenproof casserole dish, if not make the veggies in a saucepan first before transferring it to another dish to bake. Everyone has their own fave way to eat their dumplings – either lid on or lid off. Personally I like the crust on a dumpling so bake in the oven lid off. But if softer is for you then leave the lid on. I also like to add parmesan to the dumplings but if you prefer a more traditional dumpling then you can stick to the herbs alone. Step 1 Soften the cut onions and garlic in the oil for a few minutes in an ovenproof, flameproof dish, so they are soft but not browned. Step 2 Chop all the vegetables into similar size chunks. They should be around an inch in size, not too small else they will break up. Step 3 Add the vegetables to the pan of onions with the herbs, chopped tomatoes and vegetable stock. Bring to the boil and then simmer with the lid off for 20mins. Preheat the oven 200°c /Gas mark 6. Step 4 While it is cooking make the dumplings. Simply mix the flour, suet and parsley in a bowl and gradually mix in tablespoons of water until the mix just holds together, forming a soft dough. Divide into 10 portions and roll into balls in your hands. Place on a plate or floured worktop as you go. Step 5 Remove the vegetable mix from the hob and stir through the beans, season with salt and pepper. Step 6 Place the dumplings on the top of the vegetables and place in the oven with or without the lid to suit your tastes. Step 7 Bake for 20-25mins until the veggies are soft and dumplings puffed. 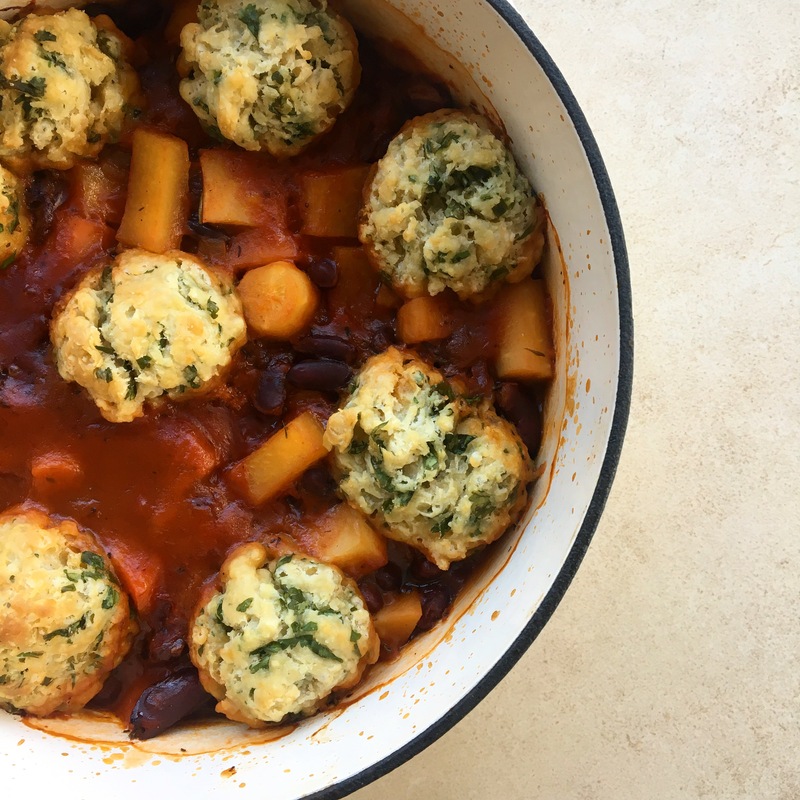 I don’t think there’s anything better than stew and dumplings! After the weather we’ve been having comfort food is just this thing I need. This recipe sounds amazing! Can’t wait to try it! That looks so tasty, I am adding that to my fall harvest recipe list for sure!! 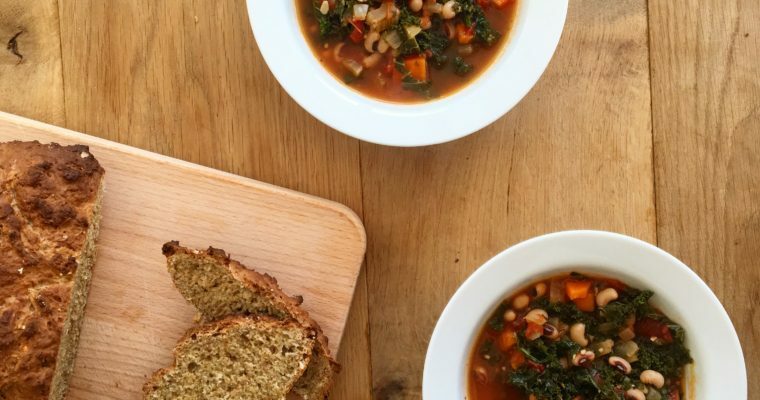 I love recipes that look and taste warm and cozy! especially in the fall as the weather starts to cool! It really celebrates that seasonal veg. Oh my goodness!! This looks AMAZING! I will definitely be sharing this recipe with my friends and family!! You’re welcome! Hope it lives up to the dream!!! Absolutely love stews in the cold weather, but at the moment we are at the end of summer here in Australia. But will definitely be making this when the cold weather hits. Thanks for sharing this awesome recipe. It’s predicted to get really cold in Aus this winter so hopefully this will warm you up! Thank you! It’s hard to take a good photo of a stew! This looks fantastic! Truthfully, I have never made dumplings but I think I need to now! This looks and sounds divine! I am soo making your stew over the weekend.